Back in 2015, Mike Moustakas bats for the Kansas City Royals. He was traded to the Milwaukee Brewers earlier this season. The Kansas City Royals are on pace to break a team record. It’s not one they’ll be proud of. In 2005, the team lost 106 games. There are 29 left this season, and whatever the Royals’ record is by then, it may not be the worst in baseball. This weekend’s series between the Royals and Baltimore Orioles will have a say: Two teams mathematically eliminated only four years after they played each other in the American League Championship Series. According to Elias Sports Bureau, only three times have multiple teams surpassed 90 losses before Sept. 1. The Royals and Orioles are the first to do so since 1979. Royals General Manager Dayton Moore admitted recently he was caught off guard by how bad this season is. “I really thought next year would be the year that we really, really struggle,” he said. 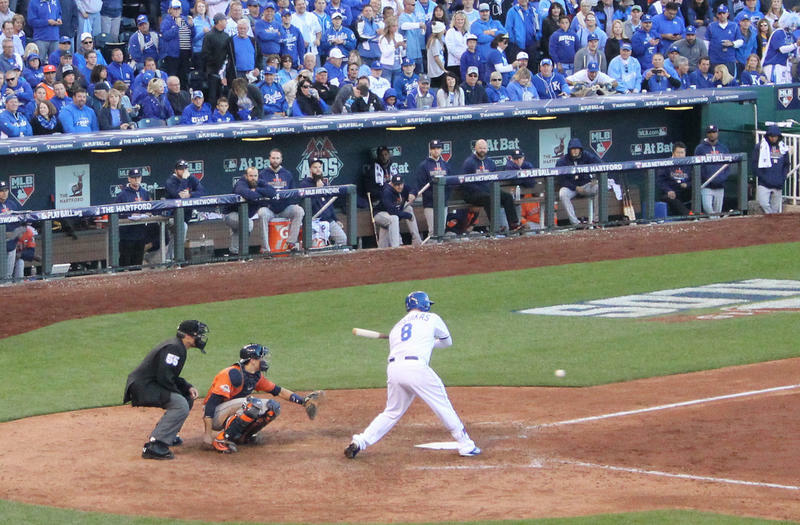 Before the season started, the Royals braced themselves for the loss of three key players from the 2015 World Series championship team — Eric Hosmer, Lorenzo Cain and Mike Moustakas. After the season-ending on-field farewell last year, Royals outfielder Alex Gordon said he had a hard time saying goodbye. “For what they’ve done for this city and for this organization, I can’t even explain how important it is for what they’ve done,” he said that day. Hosmer went to San Diego in free agency, Cain joined Milwaukee Brewers, but Moustakas didn’t get the contract offer he expected and returned. The Royals signed veterans Lucas Duda and Jon Jay. But just a few weeks into the season, the Royals were practically out of contention. “That’s disappointing to all of us, especially those that are putting the uniform on and living it each and every day,” he said. Moustakas got a reprieve: The Royals dealt him to Milwaukee before the July 31 trade deadline. The rest of the team was not as lucky as Moustakas, and it’s shown. Starting pitcher Danny Duffy has been ejected from a game twice — the first two times in his seven-year big league career. “I know we’re in last place. Lock it in, lock it in,” he said on Aug. 11, referring to first base umpire Adam Hamari on a disputed check-swing. During the same at-bat, Duffy gave up a two-run homer to the Cardinals’ Harrison Bader. “We all are trying our butts off. We’ve got to lock in on every pitch,” Duffy said. The 2003 Detroit Tigers set a modern A.L. record with 119 losses, and one of their starting pitchers that year was Steve Sparks. Royals Manager Ned Yost faces the media on Saturday, Aug. 25. Moore said he’s aware of the players’ potential to hang their heads before the first pitch is thrown, adding that Manager Ned Yost is battling that. “You’ve got to come ready every single day to be positive. That’s what Ned and the coaching staff do so well,” Moore said. But it doesn’t stop there. Moore said the front office also takes on the responsibility to keep things upbeat throughout the minor league system. “We’ve got to make sure we’re communicating, being positive and letting them know that there’s a vision that we all share together to get us back to where we were,” he said. There’s an upside to this battle of futility between the Orioles and Royals — the top pick in the 2019 draft. It sounds like a big prize, and it can be if you develop those draft picks. Case in point: A handful of players from that ‘03 Tigers team made it to the World Series three years later (but lost to St. Louis). Sparks wasn’t with them in 2006, but he’s seen another turnaround as a member of the radio broadcast team in Houston. The Astros lost 111 games in 2013. They won the World Series in 2017. “When the team’s going well, everybody expects something good to happen. And that’s when things turn into one of those magical seasons,” Sparks said. The Royals have a prospect to watch in Double A right now, Khalil Lee. The 20-year-old, who was drafted in 2016, is a fleet-footed outfielder and all-around athlete with some power. As for Yost, his contract is up at the end of this year, and he’s given no indication that he plans to step aside in the midst of another rebuilding job. The fan base has its own question: Got any other players for next year?